Brian Williams recently reported on NBC Nightly News that black shelter dogs are euthanized at a much higher rate than others because they are less likely to be adopted. But does the color of an animal’s coat really matter to a pet owner? However, it is more difficult to photograph black dogs than lighter-colored animals, and pictures help people make a connection with a potential pet, McCobb says. If a shelter has a large pool of black dogs, pet seekers can be drawn to animals in colors that are in short supply, she says. Several studies about the so-called black dog syndrome reached polar-opposite conclusions, says Nicholas Dodman, director of the Animal Behavior Clinic at Cummings School. In two studies of shelter dogs, potential adopters shunned those with solid black coats. 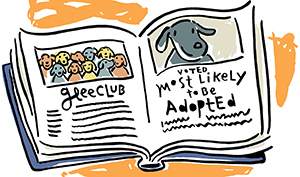 In two other studies, though, black or mostly black dogs were more likely to be adopted. A 2013 study that looked at how long dogs stayed at two New York shelters found that the color of the canine coat had no effect on the animals finding a permanent home. Adapted with permission from Your Dog: The Newsletter for Caring Dog Owners. To subscribe, visit tuftsyourdog.com or call 1.800.829.5116.